For the Çanakkale meteorite of 1964, see Meteorite falls. Çanakkale (pronounced [tʃaˈnakkale]) is a city and seaport in Turkey, in Çanakkale Province, on the southern (Asian) coast of the Dardanelles at their narrowest point. The population of the town is 186,116 (2014 estimate). The current mayor is Ülgür Gökhan (CHP). Çanakkale is the finishing point every year for an organised swim across the Hellespont from Eceabat. This event emulates the swim in 1810 by Lord Byron, who was himself emulating the legendary swim by Leander in the story of Hero and Leander. The city is the nearest major town to the site of ancient Troy. The "wooden horse" from the 2004 movie Troy is exhibited on the seafront. Çanakkale is the name for a site earlier known as Kale-I-Sultaniye, which was adopted as the official term for the town in 1890, though current a century earlier. Çanakkale was an Ottoman fortress called Kale-i Sultaniye (Ottoman Turkish: قلعة سلطانيه‎) or Sultaniye kalesi (Fortress of the Sultan). From the late 17th century it also became known for its fine-glazed pottery, Çanakkale ceramics, compared by one traveler to Delftware hence the later name Çanak kalesi 'pot fortress'. The Greek Byzantine name for Çanakkale چینک قله was Δαρδανέλλια, Dardanellia, from which the English name Dardanelles is derived. 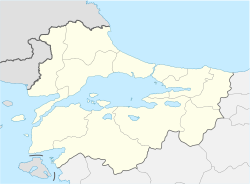 As of 1920, the British began to call Çanakkale, Chanak and Kale Sultanie in their reporting. Ancient Abydos, where the story of Hero and Leander takes place, is to the north of Çanakkale. The first inhabitants of the area, which hosted many civilizations, lived on the Biga Peninsula in the Last Chalcolithic Age c. 6000 years ago. However, very little is known about the identity and lifestyle of these early settlers. According to some excavations and research, the earliest settlements in the region were established at Kumtepe. It is supposed that Kumkale was established in 4000 BC and Troy between 3500–3000 BC. Aeolian Greeks settled on the land in the 8th century BC and established trade colonies in the region called Aeolis. The region came under the control of the Lydians in the 7th century BC and under the control of the Persians in the 6th century BC. Aeolis went under the control of the Ancient Macedonian army as Alexander the Great defeated the Persians by the Granicus River of the region in the Battle of the Granicus on his way to Asia. The region came under the reign of the Kingdom of Pergamon in the 2nd century BC. Çanakkale itself was built as a fortress in 1462 by Mehmed II Fatih, who gave it the name Kale-I Sultaniye, since one of the Sultan's sons had collaborated in its construction. Sited on a bay at the narrowest point of the strait, it, together with another nearby fort, Kilid Bahr, provided an excellent position for controlling traffic through the Dardanelles. The two forts were quickly called in the travel literature "The Castles", and a town developed to the north-east, settled by Armenian refugees and Spanish Jews. The western part of the Biga Peninsula where ancient Troy is situated was called Troas. Alexandria Troas, an important settlement of the region, was a free trade port and a rich trade center during Roman times. Later in the 2nd century AD, the region was attacked by Goths from Thrace. During the 7th and 8th centuries, in order to attack Constantinople the Arabs passed the strait a few times and came up to Sestos. At the beginning of the 14th century the Karasids dominated the Anatolian part of the strait. During the first half of that century Demirhan Bey from Karasids attempted to dominate the region. The Ottomans gained control of Gallipoli in 1367. In 1915, during the First World War, British Empire and France attempted to secure the waterway through the Straits and ultimately capture Constantinople. Known as The Gallipoli Campaign, or the Dardanelles Campaign, in Turkey it is referred to as the Battle of Çanakkale (Turkish: Çanakkale Savaşı), during March 1915 when the Royal Navy failed to force the Dardanelles and suffered severe losses. During a series of operations, HMS Triumph, HMS Ocean, HMS Goliath, HMS Irresistible and the French battleship Bouvet were all sunk. The French submarine Q84 Joule and the Australian submarine AE2 were also destroyed and several other important ships were crippled too. Most of the damage was inflicted by mines, though a German U-Boat and Turkish small craft contributed too. As of 1920, the city was estimated to have a population of approximately 22,000. An active port city, it was a stopping point for vessels traveling through the strait, as it had been in the ancient past. It was described as lacking quality accommodations and resources for those passing through by the British who visited the region. Exported goods from the city included wine, hides, pottery, ceramic tiles and grain. The service of education throughout the city is above the country average. There are 13 high schools and a college within the boundaries of the city. Çanakkale Onsekiz Mart University has 12 faculties, 4 institutes, 9 4-year colleges, 14 vocational schools and serves more than 52,000 students in the all area. 30 percent of the city population are college graduates. Çanakkale has one airport, which is 3 km from the city centre, serving since 1995. Anadolu Jet, a trademark of Turkish Airlines, and Borajet has flights from Istanbul and Ankara seven days a week. , E90/D200, and E87/D550 respectively. There are buses from Istanbul and Izmir at any time, day or night. It takes five and a half to six hours to get from Istanbul to Çanakkale, and about the same time from Izmir. North of Çanakkale at 40°10′17.66″N 26°24′34.34″E﻿ / ﻿40.1715722°N 26.4095389°E﻿ / 40.1715722; 26.4095389﻿ (TBG transmitter), there is a guyed mast used for the maritime LF-transmitter TBG, working on 53.4 kHz. Çanakkale has a mediterranean climate with hot and dry summers and cool and rainy winters. Snow falls ordinarily every winter. ^ a b c J.M.Cook, The Troad:An Archaeological and Topological Survey, Clarendon Press Oxford 1973 p.53, and n.3. ^ Régis Darques, Salonique au XXe siècle: De la cité ottomane à la métropole grecque, editions CNRS 2000 p.299. Encyclopædia Britannica Eleventh Edition s.v. Dardanelles (town). Wikimedia Commons has media related to Çanakkale. Wikivoyage has a travel guide for Çanakkale. An overview of memorials, cemeteries and relics of the Gallipoli campaign, in Turkish known as the Çanakkale wars.